Previous studies suggested associations between prenatal exposure to air pollution and hypertensive disorders of pregnancy. We explored the associations between ambient concentrations of five major air pollutants during preconceptional and prenatal periods and three hypertensive disorders of pregnancy in Seoul, Korea, using a population-representative cohort. We obtained heath and demographic data of pregnant women residing in Seoul for 2002–2013 from the Korean National Health Insurance Service–National Sample Cohort. 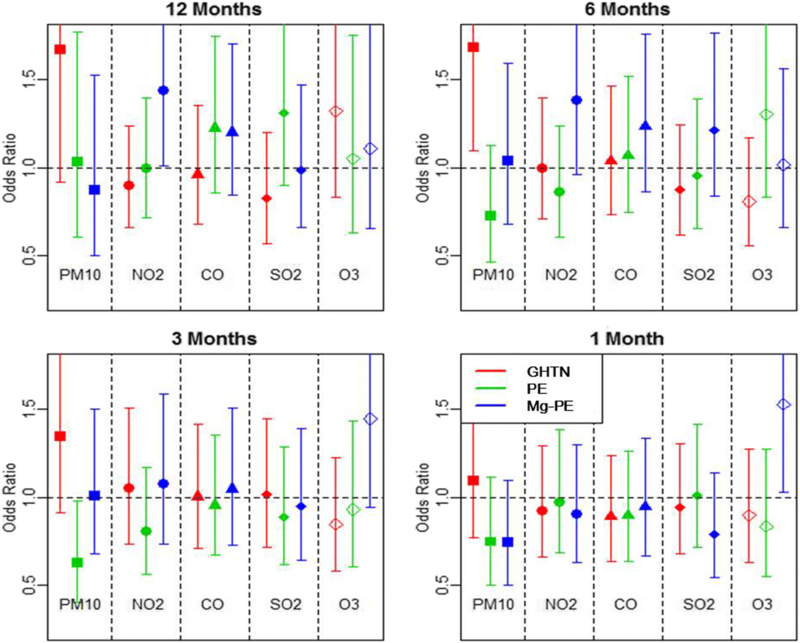 For mother’s individual exposures to air pollution, we computed concentrations of particulate matter ≤10 μm in diameter (PM10), nitrogen dioxide (NO2), carbon monoxide (CO), sulfur dioxide (SO2), and ozone (O3) during 1, 3, 6, and 12 months to birth using regulatory monitoring data in Seoul. The associations between air pollution and hypertensive disorders were explored by using logistic regression models after adjusting for individual confounders. Among 18,835 pregnant women in Seoul, 0.6, 0.5, and 0.4% of women developed gestational hypertension, preeclampsia, and preeclampsia requiring magnesium sulfate (Mg-preeclampsia), respectively. Although most odds ratios (ORs) were not statistically significant, we found increasing risk gradients with disease severity depending on the pollutant. There was the association between PM10 during 6 months to birth and gestational hypertension (OR for an interquartile range increase = 1.68 [95% confidence interval = 1.09–2.58]). NO2 and ozone during 12 and 1 month, respectively, before birth were associated with Mg-preeclampsia (1.43 [1.01–2.03], 1.53 [1.03–2.27]). We observed positive associations of exposure to some air pollutants before and during pregnancy with hypertensive disorders of pregnancy among the Korean general population. Future studies with refined exposure metrics should confirm our findings. Hypertensive disorders of pregnancy are major direct causes of perinatal mortality and morbidity [1–3] leading to profound consequences on short-term and potentially long-term basis for maternal and child health [4, 5]. Hypertension developed during pregnancy in some women progress to preeclampsia and mothers with preeclampsia can experience fatal complications including eclampsia [6, 7]. The women with history of hypertensive disorders of pregnancy also have increased risk of cardiovascular disease, stroke, and type II diabetes later in life [8–11]. The babies of affected mothers are more likely to show intrauterine growth restriction, preterm birth, and low birth weight due to decreased placental blood supply and medically indicated delivery [12, 13]. Furthermore, the offspring shows higher rates of admission to neonatal intensive care units and increased risk of hospitalization for infectious, nervous, respiratory, endocrine, and metabolic complications . In adulthood, they are more likely to have elevated blood pressure and increased risk of stroke [15, 16]. A growing body of evidence indicates that ambient air pollution is related to hypertensive disorders of pregnancy including preeclampsia [17–20]. Ambient concentrations of air pollutants such as particulate matter ≤10 and ≤ 2.5 μm in diameter (PM10 and PM2.5, respectively), nitrogen dioxide (NO2), carbon monoxide (CO), sulfur dioxide (SO2), and ozone (O3) were associated with hypertensive disorders of pregnancy [19, 21, 22] and with preterm delivery [23, 24]. Although the mechanism of this phenomenon remains unclear, it is hypothesized that air pollution could result in hypertensive disorders and placental hypoxia via vascular constriction, inflammation, and oxidative stress [20, 25]. However, the association between air pollution and hypertensive disorder in pregnancy has been inconsistent, depending on the susceptible period, severity of hypertensive disorder, and air pollutants of concern in previous studies [17, 21, 26]. This inconsistency may originate from generalizability of study population, unadjusted residual confounders, exposure assessment approach, and the different level of air pollution concentrations across study areas [20, 27]. In addition, most studies focused on air pollution exposure for a few months corresponding to each trimester, without consideration of possible pro-preeclamptic effect of preconceptional exposure. The National Health Insurance Service–National Sample Cohort (NHIS-NSC) in Korea offers an opportunity for exploring the relationship between air pollution and hypertensive disorders of pregnancy among the general population. This cohort provides clinical risk factors and disease diagnoses in addition to general demographics. We restricted our analysis to Seoul, the capital of South Korea, which is densely populated (~ 10 million people) and highly polluted (annual average concentration of PM10 = 51.3 μg/m3 in 2010) compared to the World Health Organization guideline (PM10 = 20 μg/m3) . Previous epidemiological studies in Seoul reported associations between air pollution and adverse birth outcomes [29–31]. Herein, we aimed to explore the association between three types of hypertensive disorders of pregnancy and exposure to five primary pollutants (PM10, NO2, CO, SO2, and O3) before and during pregnancy in Seoul using the NHIS-NSC data. This study was based on the NHIS-NSC data which can be accessed through the National Health Insurance Data Sharing Service website (http://nhiss.nhis.or.kr). Applicants can gain access to NHIS-NSC data after securing institutional review board (IRB) approvals and making payments . The Korean National Health Insurance (NHI) is a single-insurer system established in 1989 that covers all nationals and eligible immigrants who reside in South Korea . Its database contains general demographics, including household income in percentiles and residential address, and clinical information on diagnoses, prescribed medications, procedures, and treatments covered by NHI for every visit to a health institution. From this database, the NHIS created the NHIS-NSC of approximately 1 million Korean participants who were sampled in 2002 based on a population-representative sampling design and followed for 11 years unless participants were disqualified due to death or emigration. Individuals and health institutions in the cohort were anonymized. The detailed cohort profile is previously published . Over 100 studies of medical conditions such as cardiovascular diseases and diabetes have been published using the NHIS-NSC data, since it became publicly available in 2014 [34–38]. We identified women in the NHIS-NSC who gave birth using the following stepwise inclusion criteria based on the hierarchical method suggested by Kuklina et al. and applied to previous Korean studies [34, 35, 39]: 1) those with an obstetric treatment history in an obstetrics and gynecology department and with a diagnostic code for pregnancy-related conditions (starting with ‘O8’ in the International Statistical Classification of Disease and Related Health Problems, 10th Revision [ICD-10]); 2) those with hospital admission made under a treatment code for child birth; and 3) those aged between 15 and 44 years. For women with multiple births, we included only the earliest births in the cohort. Finally, women who lived in Seoul were selected for the analysis. Hourly measurements of PM10, NO2, CO, SO2, and O3 at about 40 air quality monitoring sites in Seoul from 2001 through 2013 were obtained from the National Institute of Environmental Research (NIER). We used urban background sites, after excluding urban roadside sites, to represent residential exposures. Each of the 25 districts (the area of 10–47 km2) in Seoul has had one urban background site over the entire study period. For the districts with more than one site run for a limited period, we used the site operated for the entire period. Using hourly measurements of these air pollutants, we calculated daily representative concentrations of five pollutants: 24-h averages for PM10, NO2, and SO2, and maximum of 17 8-h moving averages for CO and O3. These maximum concentrations of CO and O3 reflected the high concentrations during commuting hours and high correlation with sunlight . We computed individual exposures of each mother by four exposure periods. Since date of birth was available without gestational age at birth in the NHIS-NSC data, we defined the four exposure periods as 12, 6, 3, and 1 month to birth, instead of each trimester. Whereas 6- to 1-month exposure represents trimester-based exposure during pregnancy, 12-month exposure additionally incorporates preconceptional period [41, 42]. We averaged daily concentrations for each of the four periods to derive representative exposure estimates for the corresponding period. Since the residential addresses were available at the district level, we assigned district-averages to mothers living in the same district as individual exposures. We assumed that mothers’ addresses at the time of childbirth were consistent to those during 12, 6, 3, and 1 month to birth, given low moving rate within a year in the cohort . We included established risk factors in the model for exploring the relationship between air pollution and hypertensive disorders of pregnancy. The risk factors were age, parity, plurality, paid employment, presence of diabetes (gestational or non-gestational) and relative level of household income [1, 3, 44]. The household income was classified into three groups (low, 0–40%; middle, 40–80%; and high, 80–100%). Diagnosis of diabetes were determined by any type of diabetes based on ICD-10 codes (E10, type 1 diabetes mellitus; E11, type 2 diabetes mellitus; E12, malnutrition-related diabetes mellitus; E13, other specified diabetes mellitus; E14, unspecified diabetes mellitus; and O24, diabetes mellitus in pregnancy). When these codes coexisted with obstetric delivery in the same year, the case was determined to have the corresponding condition. Hypertensive disorders of pregnancy were grouped into three categories representing mild to severe disease: gestational hypertension, preeclampsia, and preeclampsia requiring magnesium sulfate (Mg-preeclampsia). To reflect severity of preeclampsia, the three hypertensive conditions were determined with corresponding ICD-10 and procedure codes. Gestational hypertension was defined as the presence of ICD-10 codes for hypertension in pregnancy (O13, gestational hypertension without significant proteinuria) excluding preeclampsia cases. Presence of ICD-10 codes for preeclampsia (O14.0, mild-to-moderate preeclampsia; O14.1, severe preeclampsia; O14.2, HELLP (hemolysis, elevated liver enzymes, and lower platelets) syndrome; and O14.9, preeclampsia, unspecified) without the procedure code for intravenous magnesium sulfate (Magnesium sulfate) infusion was determined to be preeclampsia to represent cases with mild to moderate severity. Magnesium sulfate is used as the first-line treatment for severe preeclampsia presented with any symptom or sign of impending eclampsia such as blurred vision, upper abdominal pain and hyperreflexia . Since magnesium sulfate can be used for other indication than preeclampsia, Mg-preeclampsia was defined as a condition with coexistence of the ICD-10 code for preeclampsia and procedure code for magnesium sulfate infusion. The individual characteristics and concentrations of the five air pollutants during the four periods were compared between any pair of the normotensive (no hypertensive disorders of pregnancy) and the three hypertensive disorder groups (gestational hypertension, preeclampsia, and Mg-preeclampsia). Pearson’s Chi-squared test with Yates’ continuity correction was used for paired-comparison of socio-demographic and clinical characteristics. Student t test was used for comparison of averaged concentrations of the five air pollutants. To examine the association between air pollution and gestational hypertensive disorder, we conducted logistic regression analysis for each pair of the five pollutants and three hypertensive disorder outcomes by the four periods. The reference group for analyses of all three hypertensive disorder outcomes was the normotensive. In the model, we adjusted for maternal age, household income, paid employment, nulliparity, plurality, diabetes, and a long-term temporal trend. The temporal trend representing seasonal and annual changes of hypertensive disorders of pregnancy was characterized by using natural cubic spline with 12 degrees of freedom (df) (1 df per year). Effect estimates were presented with odds ratios (ORs) and 95% confidence intervals (CIs) for interquartile range (IQR) increases in each of the five pollutant concentrations. We conducted several sensitivity analyses including temporal adjustment with different degrees of freedom and adding interaction of the four seasons on hypertensive disorders. The four seasons of spring, summer, autumn, and winter were defined as March–May, June–August, September–November, and December–February, respectively. The analyses were performed using R (ver. 3.0.3; R Development Core Team, Vienna, Austria). This study was reviewed and approved by the Institutional Review Board of Gangnam CHA hospital (IRB No. GCI-16-22). In NHIS-NSC, 18,835 women who lived in Seoul at the time of delivery were identified from 2002 through 2013. The prevalences of hypertensive disorders of pregnancy were 5.7, 4.7, and 4.1 per 1000 pregnant women for gestational hypertension, preeclampsia, and Mg-preeclampsia, respectively. Table 1 summarizes the basal characteristics of the normotensive and three hypertensive disorder groups. Majority of women were aged 25–34 years (78%), housewives (71%) and nulliparous (60%). There was no Mg-preeclampsia case in women aged 15–24 years. The gestational hypertension group had higher proportion of women with advanced age than the normotensive group. Proportions of nulliparity, multiple gestation, and diabetes were higher in women with preeclampsia and Mg-preeclampsia than in the normotensive. The normotensive group showed higher level of household income than the gestational hypertension group; however, the composition in the household income tertiles was not different among the normotensive and each of the preeclampsia and Mg-preeclampsia groups. No significant seasonality was observed in the birth date of the normotensive and three hypertensive groups. Average PM10 and NO2 concentrations during 12 months to birth were lower in the gestational hypertension group than those in the normotensive. Concentrations of all air pollutants except SO2 during 12 months to birth were higher in the Mg-preeclampsia group compared with the gestational hypertension group. In general, correlation coefficients for average concentrations of five air pollutants during the four exposure periods were moderate to high (r = 0.43–0.85) between 6 and 3 months and between 3 and 1 month to birth (Table 2). Adjusted risk estimates of gestational hypertension, preeclampsia, and Mg-preeclampsia for IQR increases of the five air pollutants are summarized in Fig. 1. Patterns of the associations varied by pollutants, hypertensive disorders, and exposure periods; however, most risk estimates were not statistically significant. Average concentrations of PM10 during 12, 6, and 3 months before birth were significantly or marginally associated with gestational hypertension (OR = 1.67 [95% CI, 0.91–3.04], 1.68 [1.09–2.58], and 1.35 [0.91–1.99], respectively). There was no association with preeclampsia or Mg-preeclampsia. For NO2, CO, and SO2 during 12 and 6 months before birth, the risk estimate for each hypertensive disorder generally increased with disease severity though the findings were close to null. Average concentration of NO2 during 12 months to birth was associated with Mg-preeclampsia (OR = 1.44 [95% CI, 1.01, 2.05]). Compared to the other four pollutants, O3 showed increasing risk for a shorter exposure period. Increasing average concentration of O3 for 1 month before birth was associated with Mg-preeclampsia (OR = 1.53 [95% CI, 1.03–2.27]). In our sensitivity analysis, no particular season showed consistently large risk estimates compared to the other seasons (Additional file 1: Figure S1). Patterns of risk estimates using different degrees of freedom, which reflects various temporal adjustment, were generally consistent with those of primary analyses (see Additional file 2: Figure S2). Using a population-representative cohort, this study investigated patterns of associations between concentrations of five major air pollutants and three hypertensive disorders of pregnancy for four exposure periods. Although mostly null risk estimates were observed, there were generally increasing risk gradients for all pollutants, except for PM10, to more severe forms of hypertensive disorders of pregnancy. Risk estimates were higher with longer exposure periods than shorter periods, except for O3. In particular, this study suggested an association between air pollution during preconceptional period and preeclampsia which has not been explored previously. In this study, we observed patterns of higher risk estimates for hypertensive disorders of pregnancy with longer exposure periods such as 12 or 6 months than with shorter exposure periods, except for O3. Most studies suggested that the pro-hypertensive effect of air pollution would be short-term (i.e., 2nd or 3rd trimester) rather than long-term (12 months before birth including the preconceptional period). Thus, this finding may need another explanation. During the preconceptional period, exposure to high concentrations of air pollutants would induce systemic inflammatory reactions, which would have mediated changes in the vascular bed and blood pressure in normal healthy individuals [46, 47]. However, an adaptive process to increased inflammatory cytokines and vascular resistance in pregnant women may suppress immediate changes in blood pressure . As blood pressure in pregnancy gradually increases until child birth , exposure to increased air pollutants long before birth would make women more vulnerable to preeclampsia. Especially for NO2 exposure during 12 months before birth, this change might have occurred in a cumulative manner, showing generally greater risks with disease severity as shown in this study. The cumulative adverse effect of NO2 was consistent with previous findings in normal non-pregnant individuals [18, 49]. Thus, the reason for the null findings for most air pollutants during pregnancy for short terms may be due to the relatively short period to provoke hypertensive or preeclamptic change in this study population. The differential impact of these air pollutants on hypertensive disorders should be further clarified in future studies. We found positive associations of PM10 with gestational hypertension, but not with preeclampsia or Mg-preeclampsia, which is consistent with a previous study . Some previous studies of relationships between PM10 exposure during pregnancy and gestational hypertension have shown notable heterogeneity [17, 22, 50]. Our study also showed a negative association between PM10 and preeclampsia that we did not anticipate. Based on the general pattern of no associations for PM10 and preeclampsia, it might be one of the random findings which can be occurred in multiple simultaneous testing . Also different levels of PM10 concentrations or characteristics of study population would have contributed to the inconsistency. The different associations between three pregnancy-related hypertensive disorders and air pollution may reflect their different disease entities with distinct etiology and mechanism . Potential factors underlying the different associations between hypertensive conditions and settings should be confirmed with well-designed studies in the future. This study showed non-significant risk estimates for most pairs of air pollutants, hypertensive disorders, and exposure periods. Relatively crude estimates for individual exposures could have resulted in exposure measurement error and subsequent null associations. We used the district-average concentrations as individual exposures, which do not represent the spatial variability of air pollution among individuals within the same district. Recent epidemiological studies of air pollution assessed individual-level exposure to air pollution by using fine-scale address data and exposure prediction approaches such as land use regression, air quality models, and geostatistical methods [53–55]. These models included a large suite of geographic variables, satellite image data, or spatial correlation structure to better represent spatial variability of air pollution across people’s homes. However, because residential addresses in NHIS-NSC are available at the district level without fine spatial-scale information such as towns and streets, we were not able to apply these modeling approaches. The refined exposure assessment using fine-scale address data may yield more precise and/or accurate risk estimates. However, this exposure misclassification would not be correlated with outcome and could have led to risk estimates toward the null . Thus, true effects may be higher than those observed in this study. In addition, our use of consistent exposure estimates during pregnancy based on residential addresses at the time of birth without incorporating moving would have resulted in the null findings . However, this impact could be minimal given low moving rate within a year in the same cohort . Prevalence of preeclampsia and Mg-preeclampsia (0.9%) in our study population is much lower than those in other countries. Prevalence of preeclampsia was 2.6–3.4% in US women [20, 57] and 1.2–6% in European population [17, 26, 58]. If patients of preeclampsia or Mg-preeclampsia were not coded in the NHIS database and treated as normal cases in our analysis, this misclassification would have resulted in underestimation of the prevalence of preeclampsia. However, under-reporting is less likely in health insurance claim data created based on the national health insurance system that requires diagnosis codes for reimbursement in South Korea . There are at least three possible explanations for the low prevalence in this study: Asian ethnicity, metropolitan residential environments, and early live birth status. First, some studies reported low rates of preeclampsia in Asian population. A study that compared preeclampsia across different race/ethnicity populations showed the lowest rate of mild and severe preeclampsia in Asian/Pacific Islanders (2.0% and 1.6%) and the highest in non-Hispanic black (4.8% and 3.5%) . Other studies reported that severe preeclampsia was developed in 0.49% of Chinese women , 0.5% in Danish , and 0.4% in British study . Second, because women living in Seoul, the capital of South Korea, showed generally better health conditions than others in small cities or rural areas [64, 65], our restriction of the study population to those living in Seoul possibly resulted in low hypertensive disorders of pregnancy compared to other reports. In our previous studies for South Korea, prevalence of preeclampsia in total and severe preeclampsia (requiring MgSO4) was higher (1.2 and 0.9%) than ours [34, 35]. A Chinese study also showed significant geographical differences in the prevalence of hypertensive disorders, showing the highest (7.44%) in Northern China and the lowest (1.23%) in Central China . Lastly, inclusion of only one live birth case for each mother might have further lowered the prevalence by excluding recurrent preeclampsia and deliveries ended with stillbirth. These three explanations could also be applied to low prevalence of gestational hypertension found in our study. In addition, previous studies of gestational hypertension prevalence showed large variation across population and study areas: low rates of 1.2% in Central China  and 1.4% in New York City , and high rates of 19.4% in Zimbabwe  and 11.6% in Nigeria . This study has several additional limitations. The risk estimates for 6, 3, and 1 month to birth in this study cannot be directly compared with those in previous studies which were calculated for the first or second trimester of pregnancy. However, as the sign of preeclampsia or severe preeclampsia became evident beyond the second trimester in most cases, the gestational age corresponding to 3 or 1 month to birth may not be critically different from that of the second trimester. The null result for the relationship between air pollution during 1 or 3 months to birth and hypertensive disorders of pregnancy except O3 and Mg-preeclampsia is consistent with the results of several studies that reported same null findings in the second trimester [19, 20]. Second, we were not able to assess and control for the influence of important confounders such as smoking or obesity before and during pregnancy. Because the prevalence of smokers would be extremely low in pregnant Korean women  and presence of diabetes (which is closely related with obesity) was included in our model, results with these confounders would not be significantly changed. Lastly, this study did not include PM2.5 because there were limited available data for PM2.5 before 2008 in Seoul. PM2.5 has been suggested to have a greater health impact than PM10 . With longer temporal data, the associations between PM2.5 and hypertensive disorders of pregnancy should be explored in future studies. This study suggests positive associations between exposure to some air pollutants during preconceptional and prenatal periods and hypertensive disorders of pregnancy among the general population in Seoul. Future studies with refined exposure metrics are needed to confirm our findings. This study used NHIS-NSC data (NHIS-2016-2-167), made by National Health Insurance Service (NHIS). The authors alone are responsible for the content and writing of the paper. This research was supported by Basic Science Research Program through the National Research Foundation of Korea (NRF) funded by the Ministry of Education (2013R1A6A3A04059017, 2016R1D1A1B03933410 and 2018R1A2B6004608) and the National Cancer Center of Korea (NCC-1810220-01). The funders had no role in study design, data collection and analysis, decision to publish, or preparation of the manuscript. The Korean National Health Insurance Service-National Sample Cohort (NHIS-NSC) and regulatory air pollution monitoring data that support the findings of this study are available through submitting request forms in the NHIS website (http://nhiss.nhis.or.kr) and the open data portal website (https://www.data.go.kr), respectively. SC prepared datasets and drafted manuscript. YJ developed datasets and performed statistical analysis. SK coordinated research process and design, contributed to statistical analyses and revised the manuscript. All the authors approved final manuscript. The Institutional Review Board of Gangnam CHA hospital (IRB No. GCI-16-22) granted ethics approval and waived informed consent.